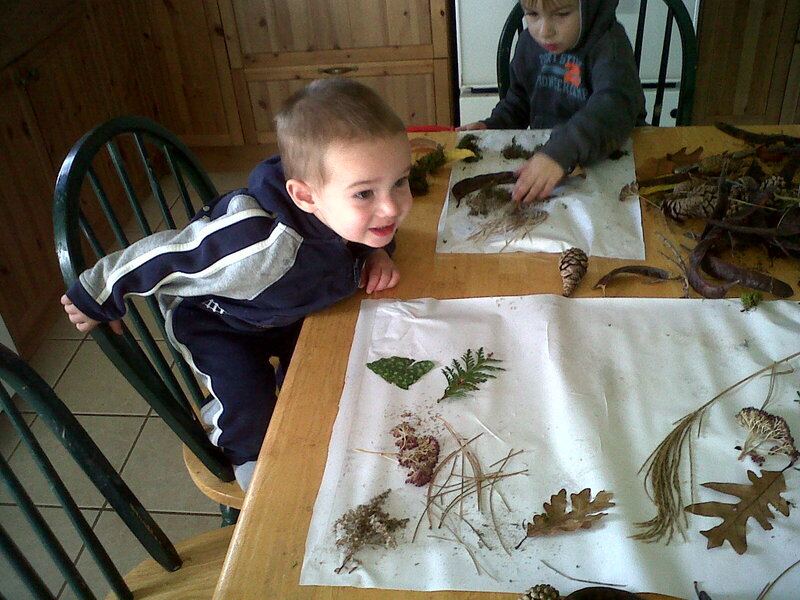 The other day I wrote about how I had wanted to do some crafts with my kids but our nature supplies kept being tossed out. Well I finally got to it and had a great time. The boys and I were going to go to the quarry (converted into a natural parkland) for a walk but decided to go to the playground instead. While we were there having a wonderful time TJ suggested that we go on a pinecone Easter egg hunt. 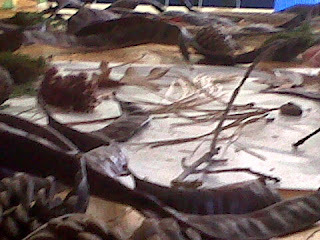 We collected all sorts of interesting things from the park, including some brown flat banana seed pods. My mom told me the name of the tree but I forget now. When we got home we went around our yard and had a great time collecting more things to bring in for a craft. We also talked a little about how different seeds travel. My niece and mom came over so all the kids were able to do our sticky nature craft. This was another idea from the 30 Days of Hands on Play from the Imagination Tree and Hands on: as we grow. I bought some shelving paper from the dollar store and taped it to the table. Peel off the backing and have fun. 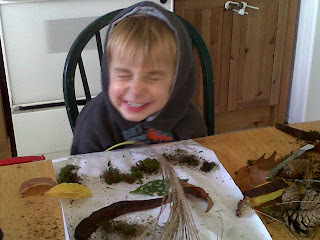 We got out all our nature treasures and the kids stuck them all over the place. They discovered that some objects stick better than others. 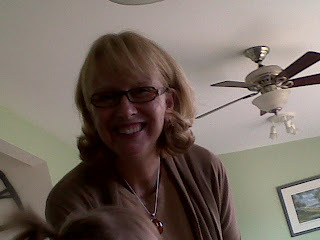 My mom and I had fun too making a little face and getting the kids involved. Our wonderful pictures are now on the front and back doors! 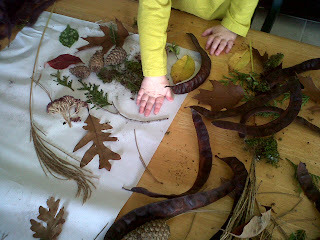 I am so excited about an idea I have for the brown seedpods. I hope to make a beautiful wreath with them. I imagine a sun burst made of the pods with some pine cones or thistles in the middle. I'll have to get more glue for my glue gun first. Some other ideas would be to find clear shelving paper and sandwich some treasures in between. 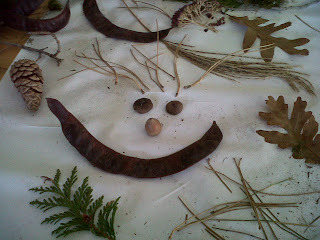 You could also use other craft supplies for a sticky picture like this. What fun it is to hunt and gather outside! What collection!